Historians and the National Park Service commemorate the Civil War’s 150th anniversary with a study of the maps of Gettysburg as well as a massive facelift made possible by modern geospatial experts. This year marks the 150th anniversary of the beginning of the American Civil War at Fort Sumter in the harbor of Charleston, South Carolina. Hundreds of battles and important events from that conflict will be remembered over the next four years, but one epic battle in 1863 stands out in the minds and imaginations of most Americans today. Considered by many historians to be the turning point in the Civil War, the Battle of Gettysburg was fought in the third year of the war on July 1, 2, and 3 and involved more than 160,000 soldiers. When the dust had cleared and the armies had moved away, nearly 10,000 soldiers had died, 20,000 had been wounded, and another 20,000 had been captured or were missing. The battle still ranks as having resulted in the greatest number of casualties of any battle in American history. Four months after the battle, on November 19th, 1863, President Abraham Lincoln delivered his now immortal Gettysburg Address at the dedication of the Soldiers’ National Cemetery on Cemetery Hill in Gettysburg where the remains of the Union dead from the battle had been reburied. Today, most of the battlefield is within the Gettysburg National Military Park that is located in south-central Pennsylvania, about 10 miles north of the Mason-Dixon line. The importance of this victory for the United States of America was recognized immediately. The future government historian of the Battle of Gettysburg, John Bachelder, who as a civilian had spent much time with the Union’s Army of the Potomac in the first two years of the war, appreciated the importance of the Union victory. 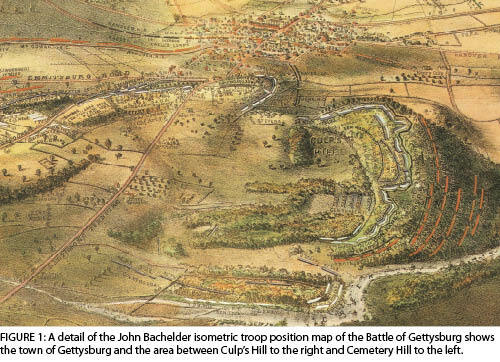 Before the Civil War, Bachelder had produced and distributed “bird’s-eye views” of towns and cities in the United States, and he wasted no time preparing an isometric view map of the battlefield of Gettysburg, including the positions of the troops during the three days of the battle. Bachelder acquired the approval of his depiction of the positions by numerous Union generals, including General George Gordon Meade, and his map was then published as a lithographic print in late 1864 (Figure 1 shows a detail). This civilian effort at capturing the terrain and action at the battle of Gettysburg has never been matched for combining artistry and depth of detail. Yet, even as Bachelder compiled his noteworthy map, topographic engineers of the Union’s Army of the Potomac were in Gettysburg at work making measurements of the battlefield features and the surrounding countryside. Among these engineers was Emmor B. Cope, the future chief engineer of the Gettysburg National Park Commission. Cope later wrote that the 1863 mapping effort had been rather cursory because the mappers lacked the proper instruments of precision and worked under disadvantages. Among the disadvantages was a lack of time, resulting in this early topographic map being more of a reconnaissance sketch accomplished primarily while on horseback (Figure 2). In the years after the Civil War when the United States Army’s Corps of Topographic Engineers were no longer under the crunch of time imposed by active military operations, survey crews were sent to Civil War battlefields to make accurate maps of them. In many instances, smaller-scale maps based on these surveys would later be used to illustrate the Atlas to Accompany the Official Records of the Civil War that was published by the United States government. Surveys for the battlefield at Gettysburg were begun on October 21, 1868 and continued until October 23, 1869. These surveys covered an area of almost 20,000 acres, stretching six miles north and south and five miles east and west, centered on the borough of Gettysburg. Unlike Cope’s hurried horseback sketch of the battlefield that had been limited by time and the amount of help available to him, the 1868 - 1869 topographic engineers’ survey was able to use civilian assistants who were hired as draughtsmen, and the parties of 1869 were composed of engineer soldiers detailed from the battalion for that purpose. When completed, the unpublished manuscript of multi-colored inks on linen made from the surveys measured 13 feet north to south and 11 feet east to west. For practical purposes, the map was broken into four sheets numbered I, II, III, and IV from east to west, and then each sheet was broken into five parts, each measuring approximately 32 inches north to south. The scale selected for the map was 1:2400, which provided ample room for depicting four-foot contour intervals as well as allowing the use of specific symbols to represent pine, oak, and round-leaf trees. Other features included on the map are four kinds of fences; houses, churches, and outbuildings; orchards, woods, streams, earthworks, houses burned from the battle; and signal stations occupied during the battle. Houses are labeled in black with the name of the resident at the time of the survey, and if a red name is shown, it indicates the name of the building’s resident during the battle. The construction material of buildings is shown on the map with the letters B for brick, W for wood, and S for stone. Because the map was surveyed and drawn under the direction of Brevet Major General G.K. Warren, Major of Engineers (and chief topographic engineer of the Army of the Potomac during the Battle of Gettysburg), it is called the Warren Map. Although Warren did spend time in Gettysburg directing the survey, most of the surveying work was led by 1st lieutenant W.H. Chase, who was assisted by 1st lieutenant Thomas Turtle and 2nd lieutenant F.A. Hinman. These men were assisted by a crew of 10 others whose specialties included topography, leveling, and drafting. Most historic sites would be lucky to have such a detailed base map that was created so close in time to the date of the actual event being commemorated. Although the Warren Map has long been considered the bible when it comes to documentation of the conditions of the Gettysburg battlefield, historians at the park now understand that the map should be considered an excellent representation of 1868 conditions. The map legend itself states, “Numerous changes have occurred since the Battle, in direction of fences, new roads being opened, houses erected, woods cleared, etc.” In an attempt to document the 1863 conditions, the Warren Map was field checked in 1873 by P.M. Blake, C.E, and additions and corrections were made in blue to show the positions of fences, buildings, etc. at the time of the battle. Buildings were marked with a blue cross to show that they were not standing at the time of the battle. Nevertheless, using 1863 photographs and numerous contemporaneous narrative descriptions of the battlefield and its features, historians have been able to identify dozens of differences in what the map shows for 1863 conditions and what the best evidence indicates existed at Gettysburg in July of 1863. The original Warren Map (in 20 parts) is now in the care of the National Archives and Records Administration (NARA). Digital versions can be accessed and downloaded using the online archival research catalog. Go to the www.archives.gov/research/arc/ website and enter the ARC identifier of 305571 in the search box that is in the middle of the screen. This will bring up the summary information for the Warren map, whose catalogued title is “Map of the Battle Field of Gettysburg, 1868 – 06/1873” and whose creator is “War Department. Office of the Chief of Engineers.” Click on the appropriate tabs to get more details, to see thumbnails of the digital files, and to download the scanned sheets to your computer. Figure 3 shows a portion of sheet two of the original Warren Map and gives you an idea of the challenge faced by the engineers as they attempted to show the battle conditions on top of an 1868 base map. In the left part of the figure is Cemetery Hill and Evergreen Cemetery, which were both important landmarks, troop positions, and scenes of fighting in July 1863. The Warren Map shows in great detail the National Cemetery, its avenues and specific burial sections, even though that cemetery wasn’t dedicated until November 1863. Symbols for lunettes (earthworks constructed to shield cannons) can be seen near the top of the figure just east of the Baltimore Pike and in the center of the figure at Stevens Hill. These battle-era features are still in evidence on the battlefield today, as are the Union earthworks on Culp’s Hill shown in the right part of the figure. The Warren Map shares the artistic beauty and depth of information of the Bachelder isometric view of the Gettysburg Battlefield, but its scientific approach and technical excellence have been so substantial that it has been relied upon for almost 140 years to guide the study, understanding, and management of Gettysburg’s historic landscapes. To date, none of the surveying field books or notes for the Gettysburg surveys directed by Warren has been found. Until more details describing the operation come to light, we can only assume that the engineers’ map was the product of the standard approach used by the U.S. Army Corps of Topographic Engineers in the decade following the Civil War. Shortly after Blake’s 1873 edit of the Warren Map was complete, the map served as the source of information for a small-scale base map (1:12000) prepared by the Office of the Chief of Engineers and published in 1876. The five-times reduction in scale of this base map allowed the entire battlefield to be shown on a single 27-inch by 28-inch sheet of paper. The purpose of this smaller-scale map was to serve as the background for the positions of the troops, with each of the three days of the battle of Gettysburg shown on a separate map. The positions of the troops were “compiled and added for the government by John B. Bachelder … from the official reports, consultations on the field, private letters and oral explanations of the officers of both armies.” This highly popular set of maps has served as the compilation source for scores of later maps illustrating the fighting at Gettysburg. Because the legend says the base map is a reduction of the Warren Map and because the smaller map was more convenient to copy and reproduce, before long many people simply called this map the Warren Map. The creation of a memorial park at Gettysburg dedicated to the soldiers who fought here began shortly after the battle in 1863. By early 1864, the Commonwealth of Pennsylvania had chartered the Gettysburg Battlefield Memorial Association to preserve the battlefield landscapes as they were and to erect monuments in order to commemorate the Battle of Gettysburg. Progress in acquiring land and erecting monuments continued through the rest of the nineteenth century, until March 3, 1893 when an act of Congress established the Gettysburg National Park Commission (GNPC) to oversee the expenditure of federal funds at Gettysburg. In February 1895, legislation was passed creating the Gettysburg National Park, and the GNPC administered the Gettysburg National Park until 1921 when administration was transferred to the War Department. Because surveying and mapping the lines of battle was one of the central mandates of the GNPC, one of its first actions was to hire Emmor B. Cope as their chief engineer. Cope soon assembled a staff of assistants consisting of S. Augustine Hammond, assistant engineer; H.W. Mattern, assistant engineer and draughtsman; Edgar M. Hewitt, rodman and chain; and Oscar McMillen, rodman and chain. From time to time, additional help was brought on, and in 1904 a temporary rodman received $40 per month while a chainman was hired at $1.50 per day. On July 26, 1893, Cope had an iron pin set at the center of the square of the town of Gettysburg to be used in their work as a datum point of reference. He connected this point with another point set on the high ground near the 126th New York Infantry monument to create a meridian line. According to Cope, “using this meridian line as a base of operations, many miles of back sight transit lines have been run on various parts of the field.” The survey point near the 126th New York monument consisted of “a granite stone set thirty inches in the ground,” and that point is still clearly visible today (Figure 4). Over the next 10 years the commission engineers created a set of existing conditions base maps at a scale of 1:2400 to match the original Warren Map. In order to keep the original Warren Map from being worn out through use, the draftsmen traced the original map sheets in black and white and then reformatted the drawings to match the new map grid created by the commission engineers. 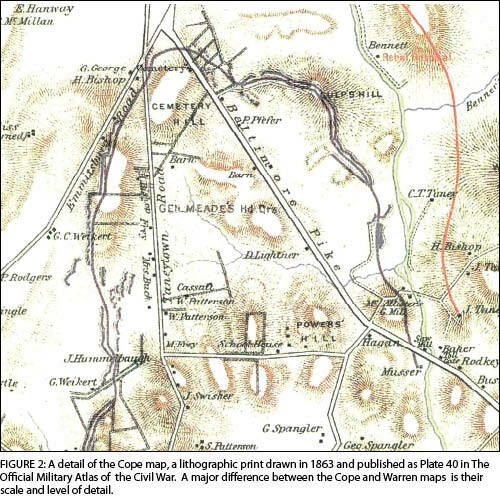 Based on the examination of locations for 1863-era features such as stone houses, large boulder groups, stone walls, and earthworks that are still visible today, Cope and his staff made significant improvements over the Warren Map in representing the geometry of many battlefield features. Interestingly though, the contours shown on all of the standard GNPC base maps are directly traced, without any alteration in location, from the original Warren Map. Any improvement in the knowledge of the terrain that the commission engineers gained through their project specific surveys was not incorporated into their working set of 1:2400 base maps. During the GNPC era, 1893 - 1921, the greatest number of the Gettysburg National Military Park’s 1400 monuments, markers, and memorials were erected. At the same time as the memorials were being raised and the park’s avenues were being laid out and constructed, the engineers conducted property surveys as part of the park’s land acquisition process. Many of the property corners were marked with granite stones six-inches square by three-feet long that sometimes had the letters US carved in the top of them (Figure 5). 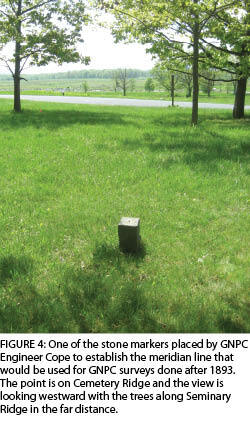 Of the park’s 526 property survey monuments that are in the ground today, about 137 of them were set by the GNPC engineers. As the park has grown, many of these survey monuments are no longer perimeter boundary markers, but they are still very important in marking the historic extent of properties that sometimes had not been subdivided since the Civil War. The final part of this series details the National Park Service’s efforts to preserve and restore the Gettysburg battlefield and landscape. With the Warren Map as a base, they are using such modern technology as GIS, digital orthophotos, and lidar to rehabilitate the cultural landscapes to their 1863 appearance within the next ten years. Curt Musselman is a native of Gettysburg, PA and is the National Park Service cartographer at the Gettysburg National Military Park. He has a BA in history from Bucknell University and an MS in cartography from the University of Wisconsin-Madison. He has also worked as a licensed battlefield guide at Gettysburg and as a quality assurance program manager at Esri.